Hayes, UK, November 14, 2018 – PFU (EMEA) Limited, a Fujitsu company, the world's leading scanner manufacturer, today announced it has partnered with international cloud bookkeeping solutions provider Hubdoc to enable accountants and bookkeepers to digitise and process large volumes of financial documents quickly and efficiently. Incorporating the ScanSnap iX1500 document scanner and ScanSnap Cloud, Hubdoc enables users to easily scan and access documents from anywhere. For more information on the ScanSnap iX1500 scanner, click here. Hubdoc will be demonstrating the integration with the iX1500 and ScanSnap Cloud at Xerocon London, 14-15 November at the Excel Centre. PFU (EMEA) Limited is a specialist company within the Fujitsu family that’s dedicated to information management solutions. We offer advanced technology, intelligent software and consultancy services; that has made us the partner of choice for the world’s most ambitious organisations. So whether its document management solutions, bringing galleries online, or small format keyboards for coders, we are committed to enabling the world’s flow of knowledge. Operating in Europe, the Middle East, and Africa, PFU (EMEA) Limited is responsible for marketing and sales of Fujitsu document scanners. The European company was established in the United Kingdom in 1981 and has offices in Germany, Italy and Spain and a Knowledge Suite in France, Russia and UAE. Hubdoc is a cloud bookkeeping solution that helps small businesses and their advisors spend less time chasing financial documents and more time growing their business. With Hubdoc, documents and their data are automatically fetched from hundreds of financial institutions and suppliers, and seamlessly synced to cloud accounting software, such as Xero. Headquartered in Toronto, with 100 employees, Hubdoc is proud to support thousands of accountants, bookkeepers, and the small businesses they serve in North America, Australia, and the United Kingdom. 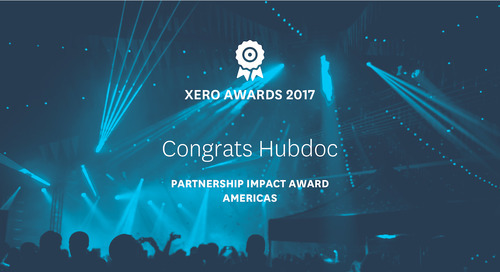 Hubdoc won top honors in the annual Xero Awards Americas, claiming the Partnership Impact award for 2017.